Is our Sun part of a binary star system? An unseen companion star, nicknamed 'Nemesis,' may be sending comets towards Earth. If Nemesis exists, NASA's new WISE telescope should be able to spot it. A dark object may be lurking near our solar system, occasionally kicking comets in our direction. Nicknamed “Nemesis” or “The Death Star,” this undetected object could be a red or brown dwarf star, or an even darker presence several times the mass of Jupiter. Why do scientists think something could be hidden beyond the edge of our solar system? Originally, Nemesis was suggested as a way to explain a cycle of mass extinctions on Earth. The paleontologists David Raup and Jack Sepkoski claim that, over the last 250 million years, life on Earth has faced extinction in a 26-million-year cycle. Astronomers proposed comet impacts as a possible cause for these catastrophes. 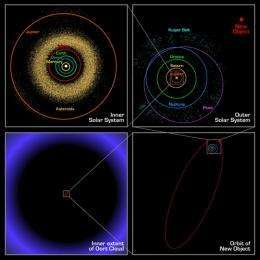 Our solar system is surrounded by a vast collection of icy bodies called the Oort Cloud. If our Sun were part of a binary system in which two gravitationally-bound stars orbit a common center of mass, this interaction could disturb the Oort Cloud on a periodic basis, sending comets whizzing towards us. An asteroid impact is famously responsible for the extinction of the dinosaurs 65 million years ago, but large comet impacts may be equally deadly. A comet may have been the cause of the Tunguska event in Russia in 1908. That explosion had about a thousand times the power of the atomic bomb dropped on Hiroshima, and it flattened an estimated 80 million trees over an 830 square mile area. While there’s little doubt about the destructive power of cosmic impacts, there is no evidence that comets have periodically caused mass extinctions on our planet. The theory of periodic extinctions itself is still debated, with many insisting that more proof is needed. Even if the scientific consensus is that extinction events don’t occur in a predictable cycle, there are now other reasons to suspect a dark companion to the Sun. The “New Object” labeled in this image is Sedna, a dwarf planet with a 12,000-year orbit around the Sun. It’s a mystery why Sedna has such an elongated orbit. A recently-discovered dwarf planet, named Sedna, has an extra-long and usual elliptical orbit around the Sun. Sedna is one of the most distant objects yet observed, with an orbit ranging between 76 and 975 AU (where 1 AU is the distance between the Earth and the Sun). Sedna’s orbit is estimated to last between 10.5 to 12 thousand years. Sedna’s discoverer, Mike Brown of Caltech, noted in a Discover magazine article that Sedna’s location doesn’t make sense. Perhaps a massive unseen object is responsible for Sedna’s mystifying orbit, its gravitational influence keeping Sedna fixed in that far-distant portion of space. John Matese, Emeritus Professor of Physics at the University of Louisiana at Lafayette, suspects Nemesis exists for another reason. The comets in the inner solar system seem to mostly come from the same region of the Oort Cloud, and Matese thinks the gravitational influence of a solar companion is disrupting that part of the cloud, scattering comets in its wake. His calculations suggest Nemesis is between 3 to 5 times the mass of Jupiter, rather than the 13 Jupiter masses or greater that some scientists think is a necessary quality of a brown dwarf. Even at this smaller mass, however, many astronomers would still classify it as a low mass star rather than a planet, since the circumstances of birth for stars and planets differ. 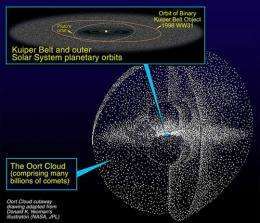 The Oort Cloud is thought to extend about 1 light year from the Sun. Matese estimates Nemesis is 25,000 AU away (or about one-third of a light year). The next-closest known star to the Sun is Proxima Centauri, located 4.2 light years away. Richard Muller of the University of California Berkeley first suggested the Nemesis theory, and even wrote a popular science book on the topic. He thinks Nemesis is a red dwarf star 1.5 light years away. Many scientists counter that such a wide orbit is inherently unstable and could not have lasted long - certainly not long enough to have caused the extinctions seen in Earth’s fossil record. But Muller says this instability has resulted in an orbit that has changed greatly over billions of years, and in the next billion years Nemesis will be thrown free of the solar system. Binary star systems are common in the galaxy. It is estimated that one-third of the stars in the Milky Way are either binary or part of a multiple-star system. Red dwarfs are also common - in fact, astronomers say they are the most common type of star in the galaxy. Brown dwarfs are also thought to be common, but there are only a few hundred known at this time because they are so difficult to see. 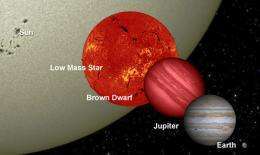 Red and brown dwarfs are smaller and cooler than our Sun, and do not shine brightly. If red dwarfs can be compared to the red embers of a dying fire, then brown dwarfs would be the smoldering ash. Because they are so dim, it is plausible that the Sun could have a secret companion even though we’ve searched the sky for many years with a variety of instruments. NASA’s newest telescope, the Wide-field Infrared Survey Explorer (WISE), may be able to answer the question about Nemesis once and for all. WISE looks at our universe in the infrared part of the spectrum. Like the Spitzer space telescope, WISE is hunting for heat. The difference is that WISE has a much wider field of view, and so is able to scan a greater portion of the sky for distant objects. WISE began scanning the sky on January 14, and NASA recently released the mission’s first images. The mission will map the entire sky until October, when the spacecraft’s coolant runs out. Part of the WISE mission is to search for brown dwarfs, and NASA expects it could find one thousand of the dim stellar objects within 25 light years of our solar system. Davy Kirkpatrick at NASA’s Infrared Processing and Analysis Center at Caltech found nothing when he searched for Nemesis using data from the Two Micron All Sky Survey (2MASS). Now Kirkpatrick is part of the WISE science team, ready to search again for any signs of a companion to our Sun. Kirkpatrick doesn’t think Nemesis will be the red dwarf star with an enormous orbit described by Muller. In his view, Matese’s description of Nemesis as a low mass object closer to home is more plausible. Ned Wright, professor of astronomy and physics at UCLA and the principal investigator for the WISE mission, said that WISE will easily see an object with a mass a few times that of Jupiter and located 25,000 AU away, as suggested by Matese. Neither Kirkpatrick nor Wright think Nemesis is disrupting the Oort cloud and sending comets towards Earth, however. Because they envision a more benign orbit, they prefer the name "Tyche" (the good sister). Regardless of what they expect to find, the WISE search won’t focus on one particular region of the sky. We may not have an answer to the Nemesis question until mid-2013. WISE needs to scan the sky twice in order to generate the time-lapsed images astronomers use to detect objects in the outer solar system. The change in location of an object between the time of the first scan and the second tells astronomers about the object’s location and orbit. “I don't suspect we'll have completed the search for candidate objects until mid-2012, and then we may need up to a year of time to complete telescopic follow-up of those objects,” said Kirkpatrick. Even if Nemesis is not found, the WISE telescope will help shed light on the darkest corners of the solar system. The telescope can be used to search for dwarf planets like Pluto that orbit the Sun off the solar system’s ecliptic plane. The objects that make up the Oort Cloud are too small and far away for WISE to see, but it will be able to track potentially dangerous comets and asteroids closer to home. The last time I checked, the Oort cloud is still a theory. Considering we're still in the process of detecting massive objects in our own immediate area, how do we justify things like "dark matter"? It would seem more likely that there's just a lot more "normal stuff" out there than we realize. While the Oort cloud may be a theory, there is enormous experimental evidence to back up it's existence. Comet orbits can be calculated after all, and the most distant from the sun part of the orbit usually resides in the Kepler belt, or the Oort cloud.